I specialize in Drupal Website Content Management web sites that make your web pages dynamic, functional and useful. Natalia Wiechowski (Think Natalia) The ME's leading Edutainer. Award-winning, bilingual (German/English) Public Speaker, Coach, Digital Influencer. I am NOT lucky, NOT blessed, NOT talented. Ask my family and closest friends! When others "chilled", I worked. When others partied, I studied. When others went on a holiday, I learned. If you want the life of your dreams, stop believing that only a small amount of "gifted" people deserve the very best in life. That is a lie to keep you unhappy, mediocre and small. Start working relentlessly towards your targets instead. No lame excuses. Daily actions, please. I am best known in the web industry as a craftsman by trade. My skills traverse web data design, web development, information architecture, web programming, search engine optimization and web publishing. I have been the Senior project leader for interactive and web projects including meeting with clients, coordinating resources, understanding the needs of the client and their audiences as well as managing production, scheduling and creative resources. 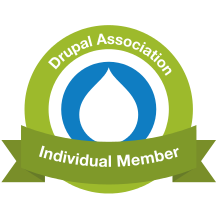 John Claussen helps support and grow the Drupal community with the Drupal Association.